Help Samuel get the care he deserves. Provides basic care for Samuel for 2 days. 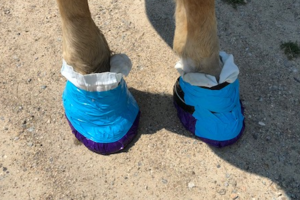 Helps with hoof care, special shoes, & packings. Covers an after-care farm call and bandage change. Makes a huge dent in the cost of the procedure. It all started with a Facebook message asking if we had any room for a draft loading in a few minutes. YIKES! My response was: "Don’t let him ship, we will figure something out." 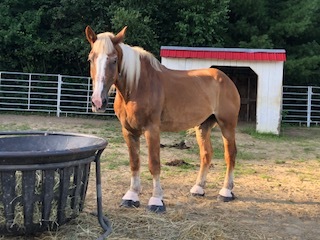 We raised enough money to cover his fee, coggins, health certificate and a little bit toward his hauling. Fast forward two weeks and $1343 later. 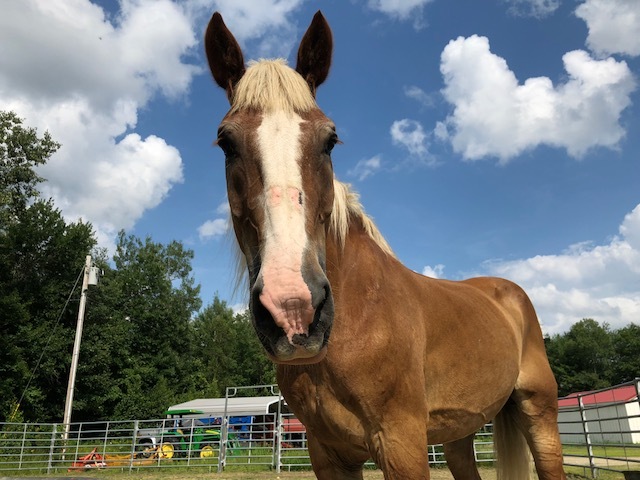 Samuel arrived in New Hampshire on Wednesday, 7/25. He met our veterinarian for the first time on Friday, 7/27. 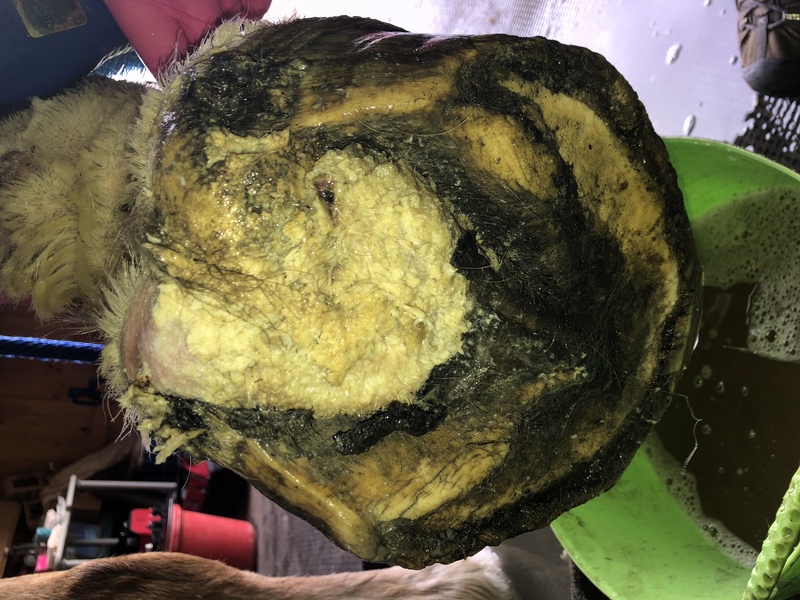 During his first appointment, we clipped his feathers, discovered maggots in his coronary bands, found suspicious evidence of canker, soaked and scrubbed his hooves, and wrapped them. Holy Moly. 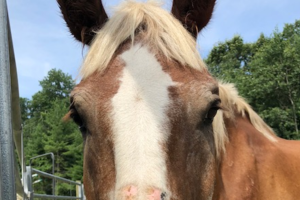 On Monday 7/30, Samuel had his next veterinary appointment. This appointment was focused on diagnostics. 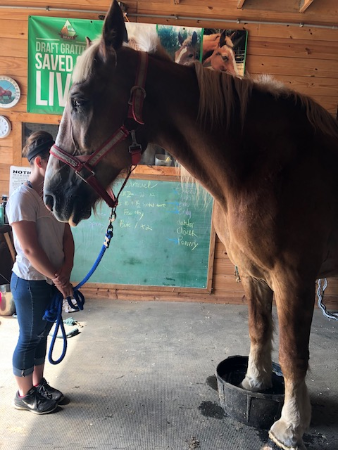 Samuel’s front hooves were soaked and scrubbed again. 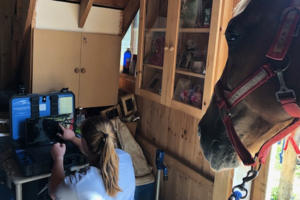 Next he had radiographs taken that showed significant arthritis but no concurrent laminitis. Blood was drawn for an ACTH test that determines Cushings Disease. 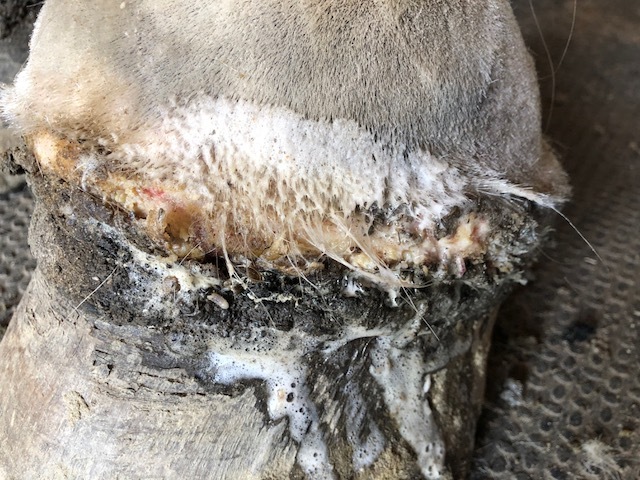 This is an important step because untreated Cushings can weaken the horse’s immune system. 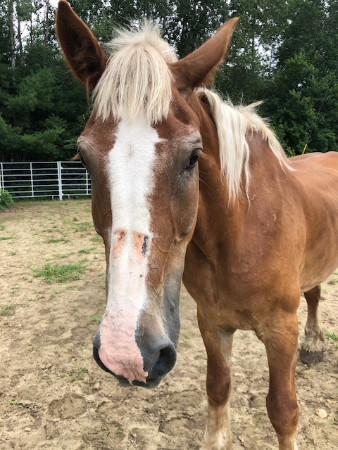 A biopsy was taken from the coronary band on his left front leg and from the suspected canker tissue from his right front hoof. After all that business, we re-wrapped both of his front hooves and put him back in his paddock. He was an exceptional patient, only needing slight sedation for the biopsy. 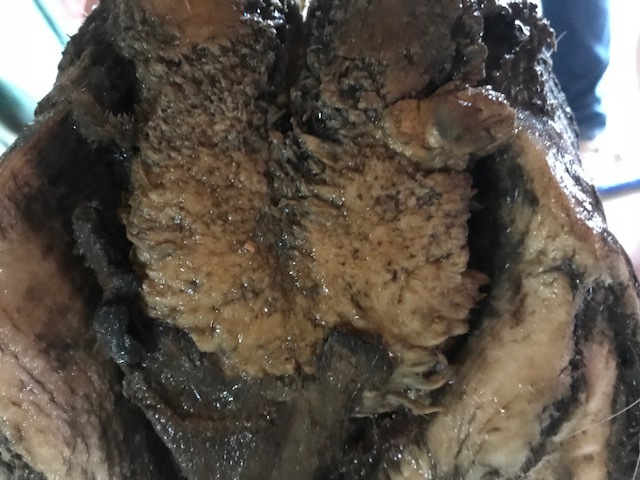 This first phase of his care will be $900-1100 to establish a baseline and to confirm the diagnosis of Canker. 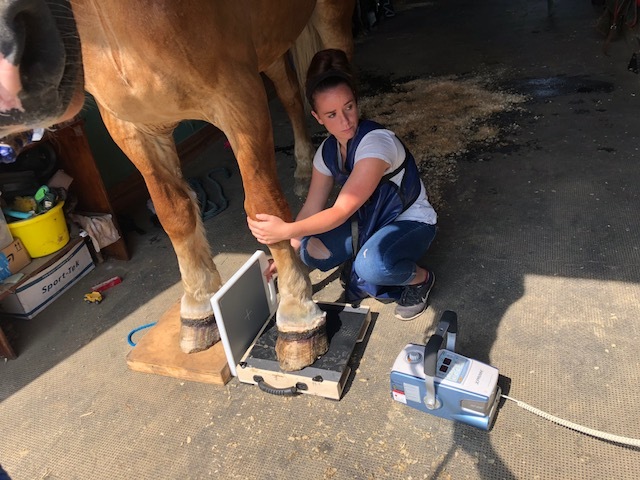 Next on his plate will be a significant procedure debriding any unhealthy canker tissue from his hooves. His front right seems to be the worst. 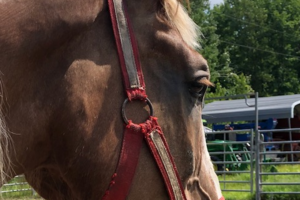 This will be done on farm with a team of veterinarians and our farrier. 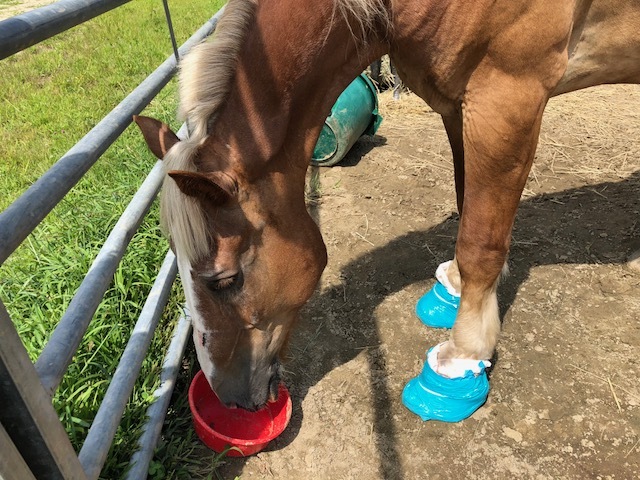 Samuel will require shoes with hospital plates to keep his hooves clean but accessible for after care. The procedure will be $1200-$1500. Finally, once we are through these first two phases, the after-care will begin. This will be time consuming and expensive. He will need recheck examinations, treatments, and frequent bandage changes. This could be as much as $2000. Samuel has spent his life working. He is quiet, well trained, and fantastic to work around. He deserves to be comfortable. When we agreed to take him in, we had no idea that we would be coming to us with such a project in tow. Nonetheless, we are grateful that he is here and are aligning all the parts of his puzzle to give him the care he deserves. Will you help Samuel get the care he needs? Please help us relieve his suffering so he can be pain free, maybe for the first time in a long time. Your gift of $20, $50, $100 or more will ensure that he gets the treatment that he needs. I know we’ve asked a lot from you this year, and here I am again, asking on Samuel’s behalf. I had no idea that his care would be so expensive, but now that he’s here, we have to give him the best care we can. Thank you so much for stepping up to help Samuel! I can’t wait for him to be pain free. Friday Is His Big Day! Samuel’s big day is coming up this Friday! 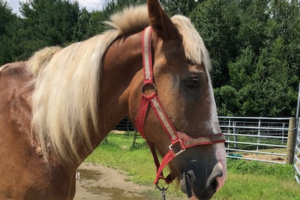 He will meet a team of veterinarians and farriers that will start the process of changing his life. 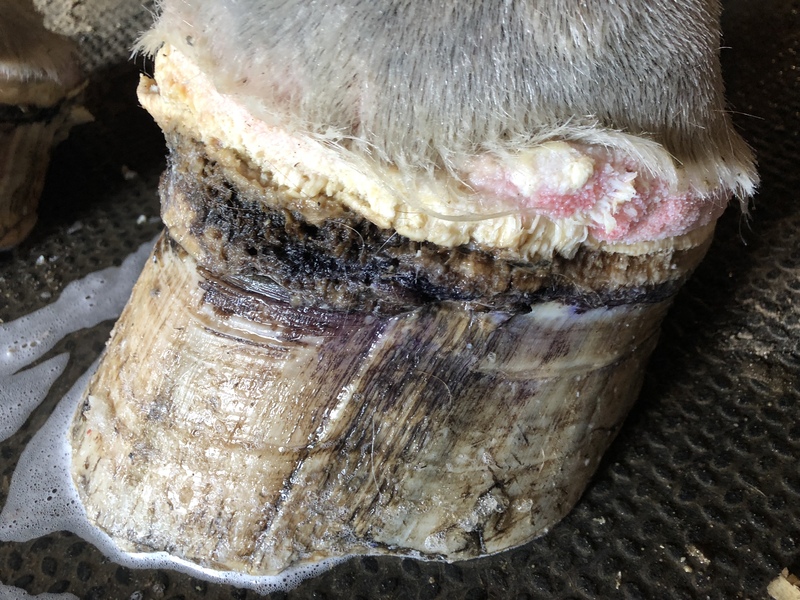 His hooves will be debrided to remove any of the canker tissue. 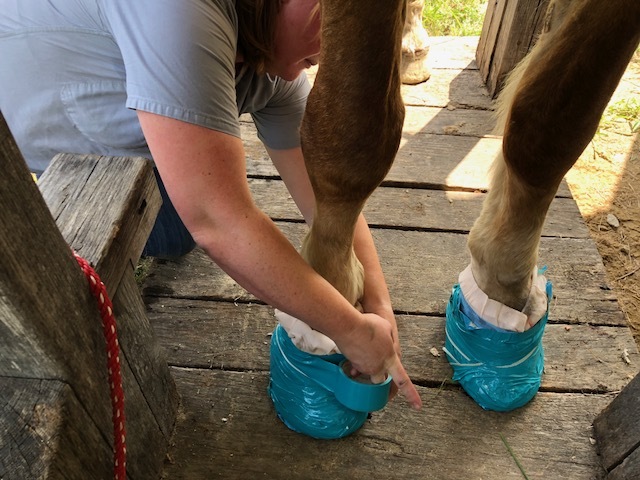 He will have his hooves trimmed, he will have front shoes placed, complete with hospital plates that are used to keep his hoof clean and provide access for flushing and packing. His procedure will be several hours. He will have sedation, pain control, and nerve blocks to get through it. 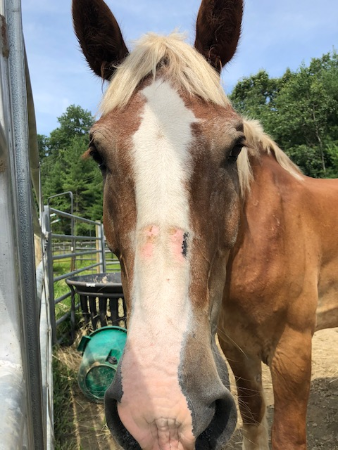 Once the initial procedure is complete, Samuel will still be in for a lot of follow up care including flushing, debriding, packing, wrapping, and anything else he needs. I will post as much as I can on our Facebook page on Friday and will be sure to send out updates. Samuel’s veterinary costs are going to be expensive. He deserves to be pain free. Over the past week, over half of his anticipated expenses have been raised. Please help us keep up the momentum so that we can reach the goal to cover his much needed care. The $500 match that was offered brought in $914! So the donor has decided to match the higher amount! Yay for Samuel! A donor has offered to match dollar for dollar on every gift that comes in up to $500!! Starting now, 8/1/18 at 9:40pm!